In a yet another case of suspected extra-judicial killings, two bodies were found dumped in the Aap Sar area of Turbat this week and identified as those of the Baloch Republican Party (BRP) central information secretary, Jalil Reki, who belonged to Quetta, and Baloch National Movement (BNM) activist Mohammad Yunus, a resident of Panjgur. And once again, Baloch nationalists announced a three-day shutter-down strike in the restive province to protest the killings. There have been so many cases of such killings over the past several months that it is difficult to keep a count of them. Respected human rights groups, including the Human Rights Commission of Pakistan, have been pointing an accusatory finger at the agencies. Ironically enough, bodies of the Baloch dissidents arrested by armed men have been appearing with greater frequency than before, ever since the Balochistan High Court started taking notice of ‘enforced disappearances’. Use of force in situations like the one prevailing in Balochistan has never helped achieve the desired results. If anything, it reinforces a people’s sense of victimhood, strengthening their resolve to fight on. No wonder, Baloch leaders expressing anger and frustration with this policy represent all shades of the political spectrum, from extremists to pro-federation moderate parties and leaders, including the ruling Peoples Party’s own appointed Governor, Chief Minister and the party’s provincial chief. For a month, PPP MNA, Syed Nasir Ali Shah, staged a sit-in in front of the Parliament House to protest his party’s failure to stop targeted killings of political activists and members of the minority Shia Hazara community. From time to time, other Baloch legislators in Parliament have also been trying to draw the government’s attention to the fact that in many parts of the province flying the national flag or singing the anthem is no longer possible. Reminiscent of a dark chapter of this country’s own history, these things show how deep run the anti-federation feelings in Balochistan. The present PPP-led government at the Centre has made some attempts, albeit feebly, to address old Baloch grievances, but it has done little to resolve the issues that now feed the insurgency. The situation being what it is, Baloch demands are quite reasonable: end military operations, and give an account for all the ‘missing’ people. The powers-that-be are in negotiations with the tribal areas-based violent extremists fighting the state. 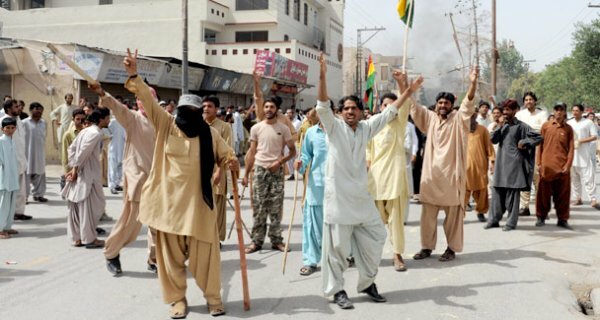 There is no reason why the same policy cannot be adopted towards the Baloch insurgents/nationalists. While trying to convince Nasir Ali Shah on Wednesday [23 November 2011] to end his sit-in, Prime Minister Gilani said: “targeted killing in the province is unacceptable.” Of course, no civilised person can support such activity. But words alone are not enough. He must translate his words into action, and do all it takes to stop custodial killings, targeted murders of the Hazara community members, and also resolve other issues that deepen Baloch alienation from the federation. A grand reconciliation plan is in order. The AHRC would be grateful if journalist and human rights organisations could assist us to correct the list about the killing of the journalists which would help us for issuing the statement on the occasion of International Human Rights Day on December 10. The security of the media persons remained a big question during the eleven months of 2011 and no proper steps have been taken to provide security by the authorities and even by the media houses. The attitude of the media houses was more indifferent towards the safety and security of journalists as compare with the authorities. The journalists who are involved in their professional duties in the conflict areas are more vulnerable and exposed before the law enforcement agencies, militant groups and other non state actors. The majority of the journalists are under paid or allowed to use only ID cards of the channels they work for and have to arrange their own earnings. During the eleven months of 2011, journalists have faced the more insecurity and intolerance when compared with previous years. Indeed, there is no change from the military dictatorships of the past. 16 journalists were killed, among them five journalists were abducted by the state intelligence agencies, kept incommunicado in different torture cells, tortured and their bullet ridden bodies were dumped on the road side. Five journalists were killed in bomb blasts while performing their professional duties, six journalists were killed in target killings. One journalist remains missing after abduction by plain clothed persons. The Balochistan Union of Journalists (BUJ) claims in its press release published by Express Tribune on June 11, 2011, that 10 journalists were killed in Balochistan this year and no investigation has been carried out. The BUJ has not provided a list of the names of those killed. In different attacks on journalists and media houses 35 working journalists, 10 camera men, one photographer, two drivers and one satellite engineer of print media and television channels were injured during the attacks, thrashed by officials and beaten by different groups. Three television channels were attacked, one was attacked on two occasions, and one FM radio station was also attacked. Two television channels were banned to stop their broadcasts. Pro-independence Baloch leader Nawab Brahumdagh Bugti Baloch. A True Voice Of Baloch; The youth icon Nawab Brahumdagh Khan Bugti.